Recently for Et Al. 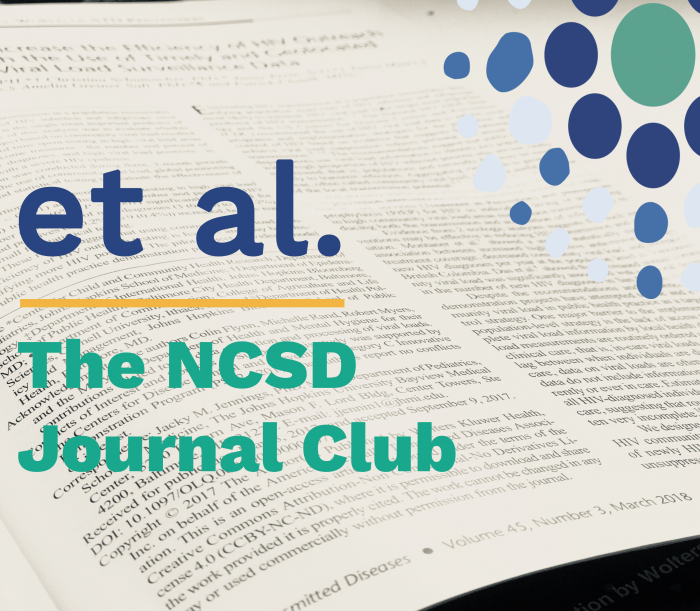 : The NCSD Journal Club, Dawne DiOrio and Amara Ross from Indiana spoke about their article in the July issue of Sexually Transmitted Diseases regarding social vulnerability in congenital syphilis case mothers. Here is a Q & A with Dawne. What are the implications of the article’s findings for best public health practice at the local, state, and national levels? Develop innovative strategies for identifying men with undiagnosed syphilis who have pregnant partners so they may be diagnosed and treated are critical to helping congenital syphilis prevention efforts. How can the findings from this article promote a change within the way an STD program addresses congenital syphilis? An STD program could conduct a review of their congenital syphilis cases following the same process that was done in the paper to understand what factors drive their morbidity. Even higher morbidity areas could review a sample of cases to gain insight to commonalities locally. If the disease intervention specialists, at present, do not collect specific enough information pertaining to social characteristics and structural barriers experienced by the case mother, the STD program should amend their interview tools to include information not traditionally gleaned in an original interview, such as maternal insurance status. Interventions could then be formulated based on results of each state’s unique barriers. STD programs could identify prenatal care providers locally who may see women at high risk of syphilis and create partnerships for those women who have interrupted prenatal care. What research related to congenital syphilis or social vulnerability of mothers needs further exploration? Additional qualitative research, including focus groups with case mothers, could be of value in helping gain a greater understanding about the mother’s risk. This could include specifically identifying what factors the mothers perceive as influencing their prenatal care attendance or what would have helped them prevent the outcome of the congenital case. Such analysis could also help generate ideas of how the public health and the health care systems could adapt to ensure future cases are prevented. If a screening criteria tool could be developed for prenatal care providers to help them identify which women are at increased risk for discontinuing prenatal care, missing testing or treatment appointments, and experiencing a high degree of social vulnerability as defined in the article, this would allow them to prioritize the women for supportive services. This model of a brief screening instrument for clinician use is already in place for alcohol, drugs, and depression/suicide and could be incorporated into early prenatal care visits to improve retention. With questions about Et Al., contact Leandra Lacy, Manager Capacity Building.